Bridesmaids no longer need to dress identically, with matching dresses, shoes, and accessories, but can add a little personality to their outfits. Follow these top tips to make mismatched bridesmaids work at your wedding. You might think your bridesmaids will look strange with completely different looking gowns, but as long as they are designed from the same fabric they will still create an overall look of unity. For perfectly matching mismatched bridesmaids simply pick a specific colour, material, and designer for the bridesmaid’s dresses and allow them select their own style. They can determine the kind of straps or neckline, the height of the hemline, the position of the waist, and the design of the skirt. You can always implement one rule such as the length of the skirt if you feel uneasy about the ladies having completely free reign. If your bridesmaids are happy to all dress up in the same style gown, you could think about opting for a range of colours to go with your wedding theme. If you are just using a single colour as your wedding scheme, find bridesmaids’ gowns in a variety of shades of that specific colour. For an autumnal wedding allow your bridesmaids select from a variety of yellow, orange, chocolate brown and gold bridesmaid dresses. Black and white weddings are fashionable at the moment, and if this is your choice you could dress your maids in a similar style dress but with alternative black and white prints. If you have selected your bridesmaids’ dresses, it is only fair that you allow them pick their accessories. You might be required to set some vague guidelines in regards of the colour of the accessories, but otherwise allow your bridesmaids to be in charge of creating an individual look. Clutch bags, jewellery, hair accessories, shoes, and wraps or cardigans guarantee there’s a big difference to the finished look of an outfit. When we think of bridesmaids dresses we generally imagine one piece gowns, but separates are also a favourable option. Choose a skirt that all your bridesmaids will wear, but allow them to pick the style of the top. This option is often favoured amongst bridesmaids as they can wear the skirt again with a more casual top, and can wear the top that they have chosen with jeans or trousers. Even if your bridesmaids are all dressing in the same gown, you can include a few decorative characteristics to the dresses in order to provide them with a different look. 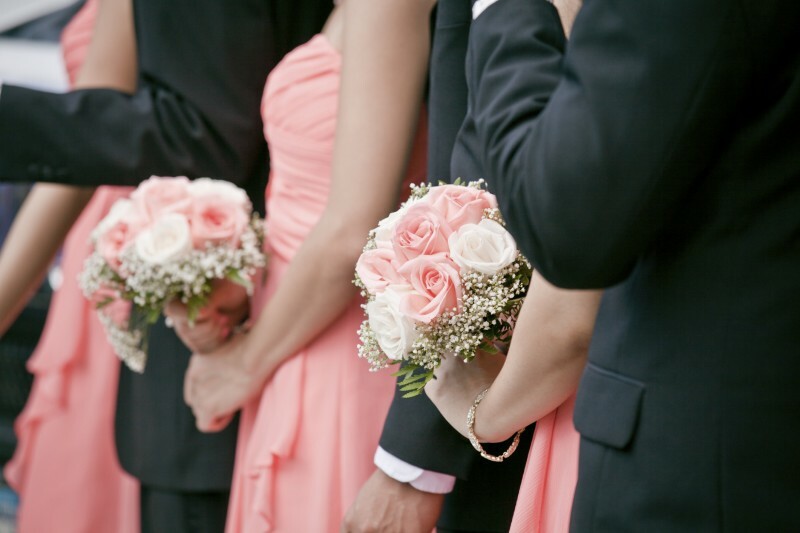 You could provide each bridesmaid with a different coloured bouquet to add contrast to their gowns. Brightly coloured corsages, sashes, hemlines and embroidery will also look amazing against simple black or white gowns. Girls just wanna have…affordable bridesmaids dresses!